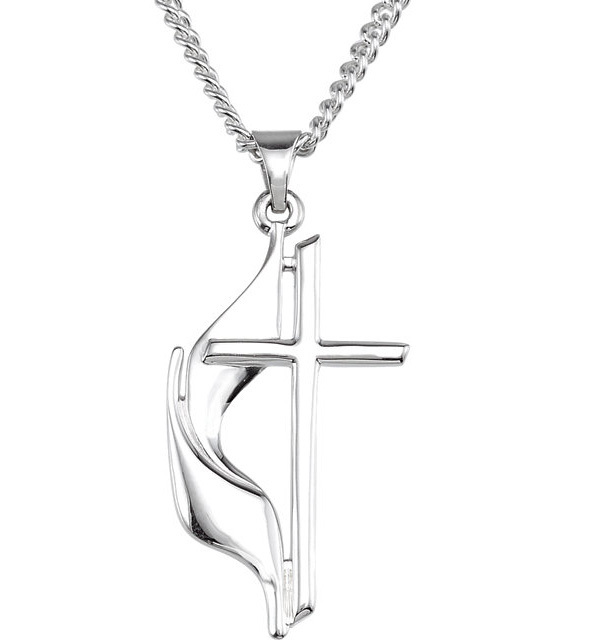 The beauty of this Methodist cross necklace in sterling silver from Apples of Gold Jewelry is captured perfectly! The .925 sterling silver is polished, giving the necklace a stunning glow. The traditional Methodist cross and flame are paired together, and the overall size of the pendant is 3/4 inch tall by just over 3/8 inch wide. The necklace includes an 18 inch curb chain necklace for women that features a spring-ring closure, making it a perfect gift for a friend or family member. "Galatians 3:26 - For ye are all the children of God by faith in Christ Jesus." We guarantee our Methodist Cross Necklace, Sterling Silver to be high quality, authentic jewelry, as described above.